Carina and Alex run the Nisia B&B, where we stayed in Barcelona. This was one of the best places we have stayed in any of our travels. In the morning Alex prepared a simple, tasty breakfast for us. We talked with him for a while, about things to do and Barcelona in general. They are also avid travelers, which is partly why they run the B&B. It allows them to take several months off during the year to do their own exploring. We began the morning at Plaza de Cataluyna, a large square at the top of Ramblas which is the main shopping and pedestrian street in Barcelona. Like usual, we were up earlier than the locals, so the shopkeepers were still setting up and the street performers were getting into costume. A half-robot man held his robot torso and laughed with the other performers. An angel let her wings rest on the ground as she smeared on heavy gold make-up. At the pet market birds, turtles, rabbits, and crazy hamsters (which ran around non-stop, perhaps driven crazy by the squawking birds) sat in cages waiting to be purchased. There were even a few hedgehogs. We spent some time cooing at the fluffy animals (OK, Kelly cooed, Ryan photographed) until the plant and flower shops opened. We stepped into some of the side streets and discovered a used bookstore (Llibreria Canuda - C/ Canuda, 4 / Barcelona), stuffed floor to ceiling with books. It was the quintessential old bookstore with piles of beautiful books and that musty book smell that Kelly likes. We found series of colorfully illustrated teen books, similar to Nancy Drew or the Bobbsey Twins. We bought one called Cartas de Brita Mari, published in 1949. Nearby was Plaza Real, with a pair of lampposts which were Gaudi’s first public commission. They are fanciful helmet-shaped structures, festooned with ribbons of metal and accented with red paint. It was cold out, so we stopped at a basement teashop for some tea before continuing on. A few blocks from Plaza Real was a colorful paper maché mask shop, El Ingenio, which had rows upon rows of crazy cartoon-like masks. The mask were fairly expensive and looked hard to transport, so we bought a little finger puppet solider to take home. Continuing down Ramblas, our next stop was the unusual baroque Betlem Church. The artwork in this church was brightly colored and modern in style which was a refreshing change from the usual dreary darkened paintings that we were used to seeing inside churches. Nearby was La Boqueria Market, which was large and chaotic, but surprisingly fresh and clean. People were selling nuts, fruit, pastries, fresh fish, and fresh meat. Everything looked tempting. It is a great place to pick up a snack - whether it is a fruit drink or hot tapas. Although choked with tourists, it was still very much a working market, and the locals were filling shopping trolleys full of goods to take home. I haven't written about our actual travel in quite awhile what with life keeping my plate full. But now I have reclaimed some time and have promised I will update this blog more frequently. Truthfully, I was a little overwhelmed by where to start. Since I have a good beginning on Spain, I'll start there and see where I end up. Segovia: Las Sirenas - meh. Barcelona: Nisia B&B - Highly recommended - This is one of the best places I have stayed. This place was almost impossible to find in the dark on our first day in Spain. We took the metro to the stop listed on their website then wandered up and down the street counting numbers but not seeing 39. We finally found the door and were greatly rewarded by what we got: beautiful, creative decor; friendly host & hostess; the Most Comfortable Bed Ever; clean room and bathroom; warm and delicious breakfast. This is basically just a lady's house that she rents rooms in. She does not accept reservations and Spanish is the language you need to speak to get a room. It was cheap (40E), super-convienent and a life-saver twice: first, when the trains filled up for Easter and we were stuck in Madrid and then again when the volcano cancelled our flight. The room we had came with its own bathroom and I was able to "borrow" internet from the places above and below me. I have no idea what the address is - check Rick Steves' - we just walked toward the giant rainbow painting/neon tower from Plaza Carmen and it was on our left. Clean, old-school hotel. Good location. Cheap breakfast. That's all there is to say, really. I learned to say "please reset your modem" after this hotel. Cool modern cafe with tasty food. The staff was very nice. Close to the bus station. The rooms were clean, but were a little damp. The whole city was pretty damp while we were there, though. We were desperate for a place since we had to shift our schedule out of Madrid (after the train was full). It was Easter so nothing was available. The location was good, but everything else was not. The hostess was a bit odd. Can't say why exactly, she just reminded me of the witch trying to lure Hansel and Gretel in with a candy cottage...The room certainly didn't deserve the star it claimed. Aside from the bed, we had a lamp with a bare lightbulb and a single nightstand. The shared bathroom was shared by too many people but the internet worked. It would be alright if it were cheap - but it wasn't. This is one of the best places I have stayed. Not the fanciest or most expensive, just all-around a good experience. The host and hostess are incredibly friendly - they even gave us a bottle of wine to celebrate our marriage. They love to travel and seem happy to talk about their travels. The whole place is efficient and modern but homey. The room has its own bathroom in the corner and a place to hang laundry out the window. Breakfast was served in the kitchen/living room and felt very comfortable. The location was good - close to the metro and within walking distance of many sites. The stairs up are tiny because they are squeezed in-between two buildings. Perfect location - next door to la Mezquita. Nice breakfast room and decor. Some nice antiques in the halls. We didn't spend much time here, so I don't have any strong lasting impressions. Not too expensive and perfectly located right on the central square (as the name indicates). Nothing remarkable about it, but the rooms had their own bathrooms and were clean. The staff was helpful. Cheap, clean, incredibly convenient. Nothing fancy. Shower in the room, which is all tile. Family-run so the desk is a little unpredictable since sometime the kids are handling the keys. But we didn't have any problems. Perfect location and a good chance to save a little money. I was nearing exhaustion by the time we reached Grenada, so this hotel was perfect. It is a 3-star, so it was more expensive than most, but the service was stellar. (No-pun intended). Clean, comfortable, great location. Not in Spain, but very close. I love staying guest houses like these. Cheap, clean, convenient. Speak a little French or be good at Charades. 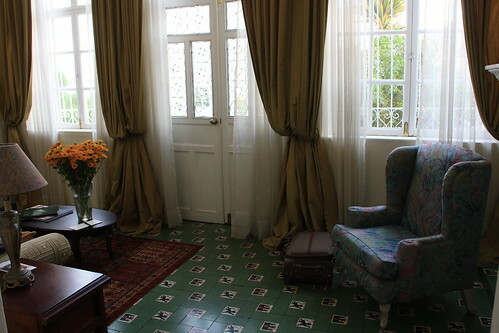 Quito: Mansion Del Angel - Our sitting room, originally uploaded by Flagstaff Mouse. We moved from the homey Cafe Cultura to a much more formal hotel in the Old Town called Mansion del Angel. The building was built at the turn of the 20th century as the home of a Ecuadorian tobacco tycoon. The ground floor, where we stayed was originally designed for entertaining but has now been converted into rooms. Outside a pleasant garden rings the house and each room seemed to have an entrance into the garden. The architect was Italian so there are many European influences, including a tile floor that looks like it is straight out of Spain. I preferred Cafe Cultura, but this hotel was more conveniently located - right next to Alameda park and many bus and trolley lines. One thing to note is that this hotel moved recently, so the guidebook we were using had the wrong address. The old address was almost impossible to find in a taxi because of the one-way streets and poorly marked buildings. We spent almost half an hour trying to get there, then ended up taking another taxi to get us to the actual hotel. We got lots of practice attempting to communicate in Spanish along the way and learned that asking the police for directions is rarely helpful. IMG_4050, originally uploaded by Flagstaff Mouse. On our first night in Quito we stayed at the hotel Cafe Cultura. The hotel is in an old house and as a result, it feels very homey. Our room was on the 3rd floor so the roof created a sloping wall. The bathroom had semi-opaque glass walls that let in the 12 hours of sunlight and a clawfoot tub. You wake up with the sun in this room. On the tables were strewn copies of a highly random collection of books - a guidebook in Japanese, one of the Laura Ingalls Wilder books, Louis L'Amour, to name a few. Breakfast was pretty expensive ($9) but creative for a hotel. They had a variety of egg dishes. Ryan had Shassuka - a Morrocan inspired dish. I had museli with fresh fruit and yogurt. The mora (blackberry) juice was thick and tangy and quite tasty. The price was reasonable for a boutique hotel and I'd highly recommend it. The staff was very friendly, but not uncomfortably formal. The ambiance was great.